After last week's underwhelming episode, Agents of S.H.I.E.L.D. bounces back strong, and manages to check off a lot of items from my ever expanding AoS wish list. We get a compelling, self-contained A-plot, some not often seen character pairings, and a long awaited Mack storyline. "Watchdogs" does a good job of utilizing a smaller narrative that still remains relevant to the wider, season-long Inhumans arc. And, with Bobbi and Hunter's departure from the show last week, the cast is a little bit leaner, which means the writers can start giving increased focus to some of the other characters. This is particularly true for Mack, who gets a big bump in screen time, and plays heavily into this week’s episode. This week’s A-plot introduces “The Watchdogs”, a radical anti-Inhumans organization that’s been gaining traction recently thanks to their growing Internet following. 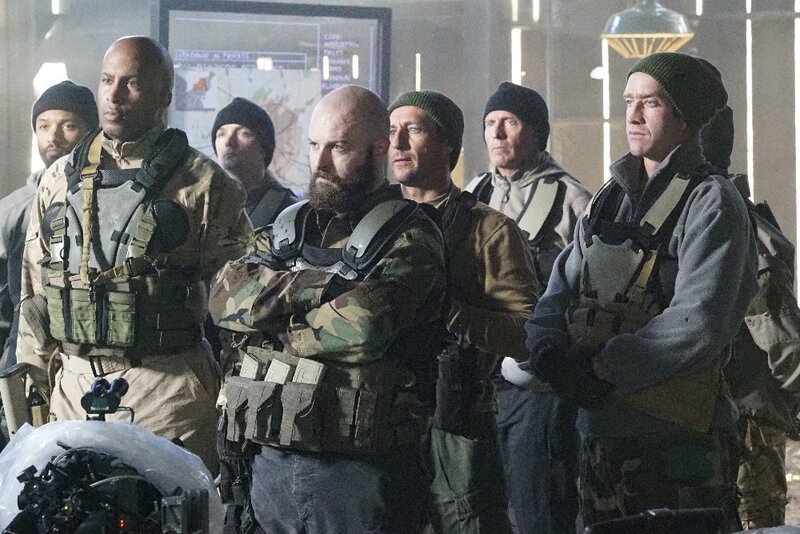 Mentioned briefly in the midseason premiere by Daisy, The Watchdogs quickly prove that they’re more than just a vocal Internet group by attacking an ATCU facility, which you’ll remember is still the public face of the government’s Inhuman response effort. The writers succeed in making The Watchdogs feel like a legitimate threat; a sometimes challenging task with a new group of bad guys. The wolf-like masks their members wear are frighteningly striking, and their tactical ruthlessness is well portrayed and consistent throughout the episode. All of this helps to differentiate The Watchdogs from your average Hydra goon, and while it’s possible that the Dogs eventually lose some of their bite, and veer into generic henchmen territory, their origins and motivations will remain intertwined with this season’s Inhuman arc, helping to keep them relevant for the rest of season three. “Watchdogs” is fairly Mack-centric, and gives us a nice glimpse into the non-S.H.I.E.L.D. part of his life; a rare development that we haven’t really seen with many other characters. Specifically, we meet Mack’s younger brother, Reuben, played by Friday Night Lights alum, Gaius Charles. Unfortunately, despite this episode’s increased focus on Mack (Henry Simmons), his storyline isn’t as compelling as it could be. We do get some fun action scenes, and Mack’s chemistry with Reuben is strong enough to believably buoy their long-simmering family tension. However, to me, Mack still remains one of AoS’s least interesting characters, and not even the best line in the show’s entire run, (“I’m the guy who kills Gordon”), or a more intimate look into his family life, is enough to suddenly turn him into something more than the show’s perpetual wet blanket and Inhuman punching bag. This episode does touch on an interesting point of contention between Mack and Daisy, though. While Daisy wants to go after members of The Watchdog’s online following, whether they were involved in the ATCU attack or not, in order to obtain information; Mack is against the idea, believing that S.H.I.E.L.D. has no right to overstep someone’s civil liberties in such a drastic way. This is the second time in the last several episodes that Daisy has had an ideological clash with a fellow team member. In the midseason premiere, she argued with Lincoln regarding the merits of a Terrigenesis vaccine, aka an Inhuman “cure.” Daisy and Mack’s debate is especially interesting given its tie-in potential to Captain America: Civil War. Without going into too much detail, Civil War centers on the philosophical debate of whether or not superheroes operate with too much freedom, and should be regulated by some type of governing body. Those in favor of regulation believe that all superheroes should register with the government, and be subject to the same types of checks and balances that our armed forces are. Those against regulation believe in the status quo- a world where every star spangled and spandex wearing good guy is allowed to lay the smack-down on whomever he or she deems fit. Another component to Civil War is how, after multiple national and global catastrophes, public sentiment within the MCU is quickly turning against super powered individuals. Believing that superheroes are actually just as responsible for creating some of the chaos in the world as they are for stopping it, everyday people, along with heroes like Tony Stark, see registration as a way to stop these problems before they ever start. The implications all of this could have on AoS, as well as the stance different characters could take on the issue, is clear. Daisy would most likely take a hard stand against registration, believing that it could eventually lead to the forced outing of her fellow Inhumans. Meanwhile, characters like Mack, May, and potentially Simmons, who are all too aware of how lethal Inhumans can be, would lean pro-registration. Captain America: Civil War debuts on May 6th, so we have about a month to see how this all plays out. But, considering what we know, it’s possible that this film tie-in could be the most game-changing since Captain America: The Winter Soldier’s Hydra reveal. For right now though, I’m enjoying the rather rebellious direction they’re taking Daisy, and if her turning against her fellow S.H.I.E.L.D. agents means more badass scenes like the ones we get in this week’s episode, I’m all for it. In my review from a couple of weeks ago, I waxed poetic on Lincoln's potential as a character, and my hope that the writers would widen his scope beyond just being a love interest for Daisy. This episode even acknowledges this dilemma; with Lincoln’s S.H.I.E.L.D. evaluation assessing that he only joined the agency for Daisy, rather than for actually believing in what S.H.I.E.L.D. stands for. Thankfully, my fears are put to rest, as this episode explores Lincoln, outside of Shake & Bake, by teaming him with Coulson. It’s always nice when we get to see two characters, who seldom interact, share some quality screen time together, and this is especially true for Lincoln and Coulson. Sparks start to fly, both literally and figuratively, when Lincoln’s cool, yet combative attitude clashes with Coulson’s authoritative and no-nonsense demeanor. I hope Lincoln is able to keep some of his strong-mindedness, and pace himself from drinking too much of the Phil Coulson Kool-aid. S.H.I.E.L.D., as an organization, has some undeniable flaws, and the show needs a character who is able to question these flaws in a convincing way. Finally, this episode gives us another rarely seen combination of characters in May and Simmons. The two bond over the fallout from their respective midseason finale storylines, and forge ahead together with their side mission to find Lash. Even with just a few scenes, this is a pairing that I’m excited to see unfold. Ming-Na Wen and Elizabeth Henstridge are consistently two of S.H.I.E.L.D.’s strongest actors, and the dichotomy between May and Simmons’ personalities suggests that we’ll see both evolve in ways that draw from one another’s strengths. After last week’s overly complicated storyline, it’s nice to get a straightforward, entertaining episode that’s still able to hit on multiple complex plot and character development points. With Bobbi and Hunter leaving for their spin-off, the cast feels noticeably slimmer, allowing us to more deeply examine characters like Mack and Lincoln, who had previously been on the fringes of the narrative. Overall, “Watchdogs” proves that Agents of S.H.I.E.L.D. is surprisingly at its best when its episodes flow through character-driven stories, rather than twisting them around a specifically desired outcome, and shaping the characters from there.